Keeping up with the daily flood of information about the benefits of plant-based eating. News about easy weight management, longevity, reduced disease, increased vitality, and environmental impact as the benefits of plant-based living – not to mention all the delicious eats – inundate my desk each day. As a matter of fact, the very day the edited second draft of my manuscript was due at my publisher (January 5) I had to ask for an extra day because new information about whole grain consumption and longevity hit the wires. How could I not include this little nugget? Here is the information I stopped the presses for. Evaluating statistics from more than 100,000 women and men over a period of about twenty-five years, researchers compared the participants’ whole grain intake with mortality data. They discovered that for every single serving of whole grains (28g/day), overall death risk dropped by 5%. And the drop was 9% for cardiovascular disease -related death. The study, which appeared January 5, 2015 (told you!) in the Journal of the American Medical Association Internal Medicine. The 100,000 subjects – who are they? Researchers looked at data from more than 74,000 women from the Nurses’ Health Study and more than 43,000 men from the Health Professionals Follow-Up Study. The subjects filled out questionnaires about their diet periodically, from the mid-1980s to 2010. When adjusted for multiple factors – age, smoking, body mass index, physical activity, and overall diet excluding whole grains – the researchers compared the participants’ whole grain intake with mortality data. That’s where they got the numbers. The study also included an advisory for replacing refined grains and red meats with whole grains as being likely to lower mortality. 8% lower mortality for swapping out refined grains and 20% lower mortality for swapping out red meat. 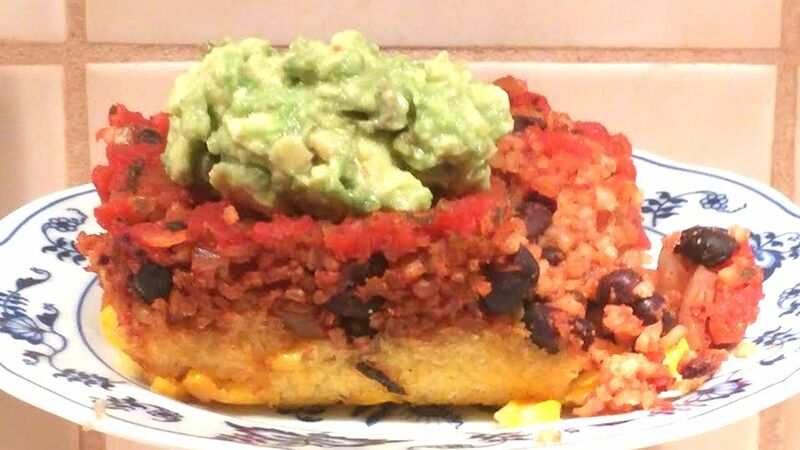 The dietitian-approved plant-based plate in The Plant-Based Journey includes seven to twelve or more servings a day – as energy needs demand – of starchies (as I lovingly call them!) in the form of whole grains and starchy vegetables. There you have it – more reason to dig into that inviting bowl of steamy oatmeal, big mound of fragrant brown rice, and chunk of comforting corn bread! How did you get your whole grains so far today? Share in replies below. The title page of Journey! This is from the review copy – still work to be done, but I couldn’t wait to share it with you! With final edits now so close, my publisher put together a review copy of the manuscript for us to send out for review and endorsement. I took this screenshot of the title page to share with you. 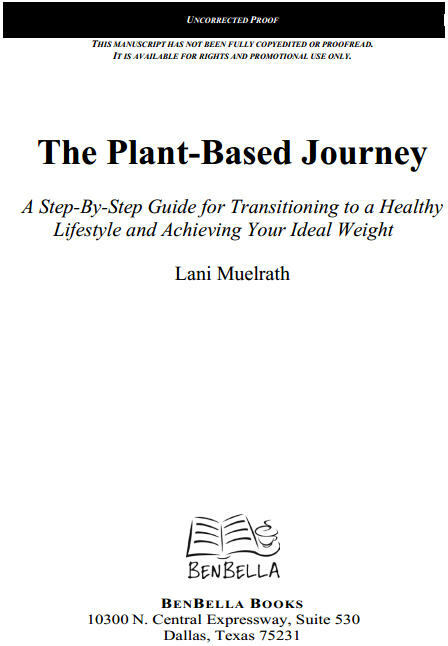 *excerpted and adapted from The Plant-Based Journey, BenBella Books, 2015. Hongyu Wu, Alan J. Flint, Frank B. Hu et al. “Association Between Dietary Whole Grain Intake and Risk of Mortality.” JAMA Internal Medicine,January 5, 2015. I love the way you break me out of the media and culture-induced fear of whole grains. Why are we so susceptible to the influence? Thanks for getting the research in front of us once again. I hadn’t seen this report and it is very impressive – over such a long period of time and so many people involved. Rita, I know the media push can be killer and we can feel at the mercy of it all. Staying connected with the research that is compounded over time is our ally. There are no studies I know of that point to whole foods plant-based eating as driving disease or early death or demise. And we have adapted to grain consumption via genetics that allow us to easily digest starch with increased amylase. OK, there I go! I do address it in the book! Thanks so much for stopping in to share your thoughts. I look forward to the release of your new book. I am very much in need of re-inspiration after a holiday season with too much of everything…. So — all the best and keep me posted. I wish I could put her into your hands today! I’m shedding a little holiday puff myself. Only a couple of pounds, so it’s not so bad! Are you getting in physical activity? That’s an easy way to get your brain in gear with making healthier choices. The research says so – MRI readings show that after a period of exercise people’s brains respond more positively to lighter, healthier fare than the heavy stuff, in comparison to those who don’t exercise. And that’s not because they think they should choose better, it’s actual attraction response in the brain. I put this all in the book a little more articulately (I hope!) because it is the simplest way to get your body and plate going along with your vision. I so appreciate your comments! Thank you for sharing. Lindsey, your enthusiasm and warmth mean a lot to me. Thank you so much! How did our paths cross, by the way? Your notes are always informative and inspiring. Looking forward to your new book. I just read in “Salt Sugar Fat” that Dr. John Kellogg created a whole grain cereal in 1897 to improve people’s health by providing a healthy breakfast alternative to the meat and eggs that were eaten at the time. The same truth holds true today. To bad his brother let Kellogg’s evolve into what it has become against the doctor’s wishes. Thanks for helping others by sharing this information via your website and books. Dr. Kellogg would roll over in his grave if he ever saw a box of Capn’ Crunch! Talk about corruption of an idea! Salt Sugar Fat is a great resource, isn’t it? I’m thrilled to have your contribution here today along with your enthusiastic support. Thank you! Great news on the whole grain front, and about the new book! (which I think I will have to share with every person I know.) I have been eating 10+ servings of whole grains a day for many years, and I feel fantastic. There’s nothing that keeps me more satisfied! I eat about 2 cups of cooked whole grains- either brown rice, bulgur, millet or buckwheat- at breakfast, lunch and dinner, with green, red, yellow and orange veggies. Hopefully I’m laying the foundations for a long, happy, healthy life! Emma, well, you sound like the poster girl for healthy eats! I’ll have to refer to your post next time someone pops up with their fear of whole grains. How did our paths cross? Have you a website? I’d love to have a look at your work so we can stay connected helping other people along the way! Thanks so much for sharing your success! Hi Lani, thanks for your lovely comments! I recently discovered your blog which I’ve really enjoyed reading, and have also seen your posts in a group that I’m a member of on Facebook. I do have a website, http://www.plantplate.com, where I post plant-based recipes, articles and guides. I’d love to stay in touch and help others any way that I can. You can contact me any time! Thanks for your enthusiasm and stopping by to comment. It looks like you are doing wonderful work! Yes, let’s stay in touch so together we can keep making a difference! 2) Buy rice from California, which has about half the arsenic as rice produced in, say, Louisiana. Arsenic-based insecticides – – banned in 1988 – were used extensively on cotton crops (boll weavil erradication) grown in the southeastern US. These same lands have now become, in large part, rice fields. 3)When choosing imported rice, select from Thailand, India and China. This should give you several options. And remember, there is a whole world of grains beyond rice! Diversify! Keep in mind that there are two kinds of arsenic: 1) organic arsenic, which is a natural substance found in soil – not a concern, since human bodies don’t absorb it, and 2) Inorganic arsenic found in herbicides and pesticides. This ends up in the soil, and works its way up the food chain. That’s happened to me before too! I have a book sitting on the shelf and finally get around to reading it when someone else comments! Love your comments on my book and love that you’re IN the book. Release date is September 1, so sorry it won’t be ready for your birthday! As always, thank you!! I am so excited for your new book! Its still early in the season, but planning some big camping/hiking adventures, and re-reading your adventures on how to plan food! That is so cool! Where are you heading? Were you able to find my camping for Yosemite post? Let me know how I can assist!